The highest and final residential level, Skyview Drive, is being populated now. The rest of the land will always be open space. However, the land won’t be exactly natural. It will be intensively maintained. That sturdy concrete flume in the foreground, for example, is there so rainwater runoff from the slopes won’t start digging gullies. The runoff goes to a collection basin at the bottom of the slope that keeps all the muddy sediment and sends the water on into Chimes Creek. Here’s more of that impressive drainage system, on a lower slope. What about that high rock face standing in the back? Even from this distance, it looks a little ragged, a little menacing. During my last visit, in January 2016, I was up there and it looked like this. That crumbling rock was pouring past this temporary barrier and overfilling one of those handsome concrete troughs. It’s a big and constant job to maintain this infrastructure. There’s always something to do. Who does it, and what happens when something major happens, like a landslide? In developments like these, a homeowners association typically handles repairs and upkeep for community amenities like paving, play equipment and landscaping. Those aren’t demanding tasks. But what do most homeowners know about geology? 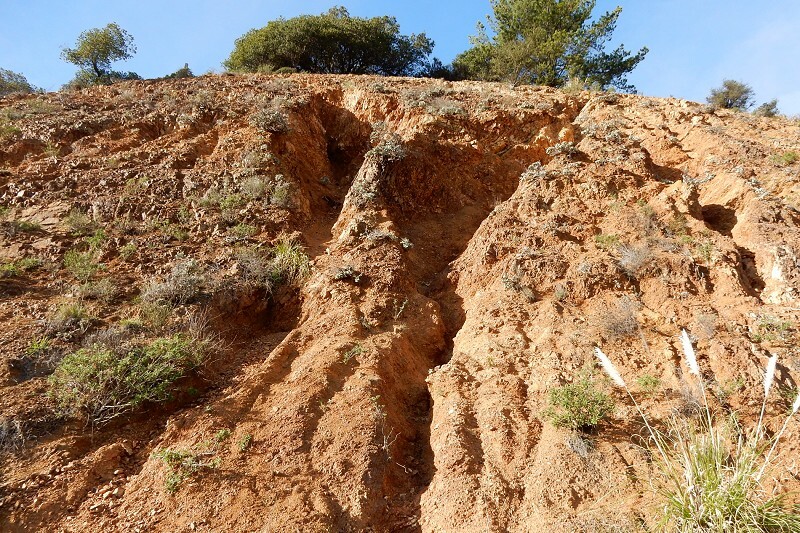 For the special hazards posed by geological forces, like erosion and landslides, there’s something better: a Geologic Hazard Abatement District or GHAD. GHADs (pronounced like “gadzooks” without the zook) are peculiar entities, created under the Beverly Act of 1979, that are set up to handle the specialized job of dealing with geologic hazards for a specific set of landowners. 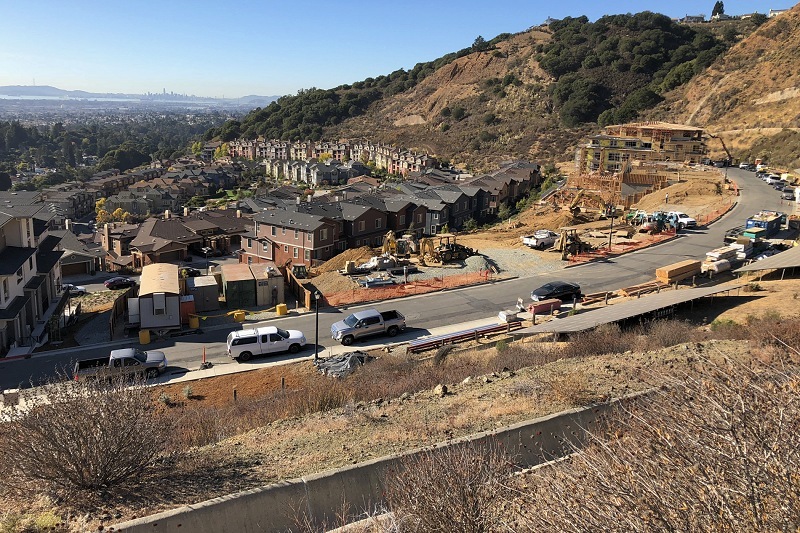 Formally political divisions of the state independent of cities and counties, they’re exempt from bureaucratic headaches like reviews under the California Environmental Quality Act (CEQA) or hassles with the county’s LAFCO agency (and its wretched website). They have elected Boards of Directors and can own land, impose taxes, issue bonds, exercise eminent domain and possess other superpowers. There are dozens of GHADs now, and Alameda and Contra Costa Counties are their epicenter. What keeps GHADs from running amuck or shirking their job is their “constitution,” a detailed Plan of Control drawn up by a licensed engineering geologist that ensures the Board will act with a prudent level of care. 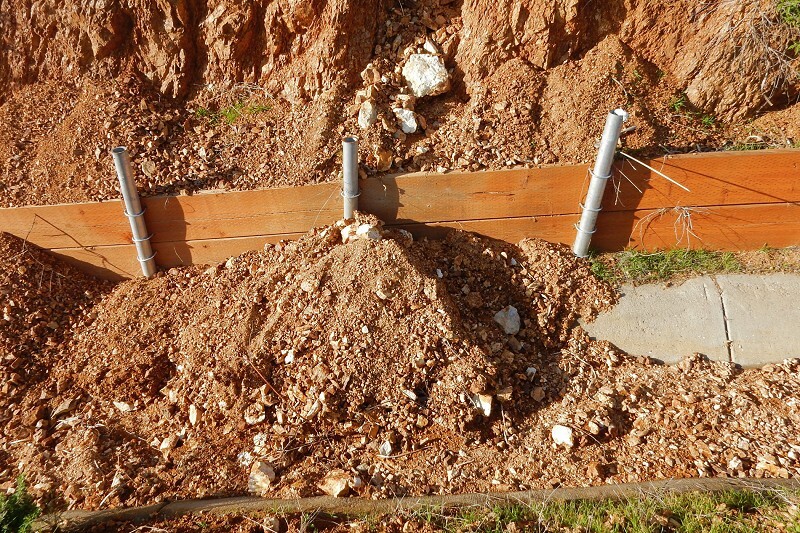 The program of regular monitoring and maintenance is spelled out in an Engineer’s Report, prepared by a licensed geotechnical engineer. It’s a simple but powerful program that spares taxpayers the geological risk inherent in developing sites like Leona Quarry. Learn more from the California Association of GHADs. 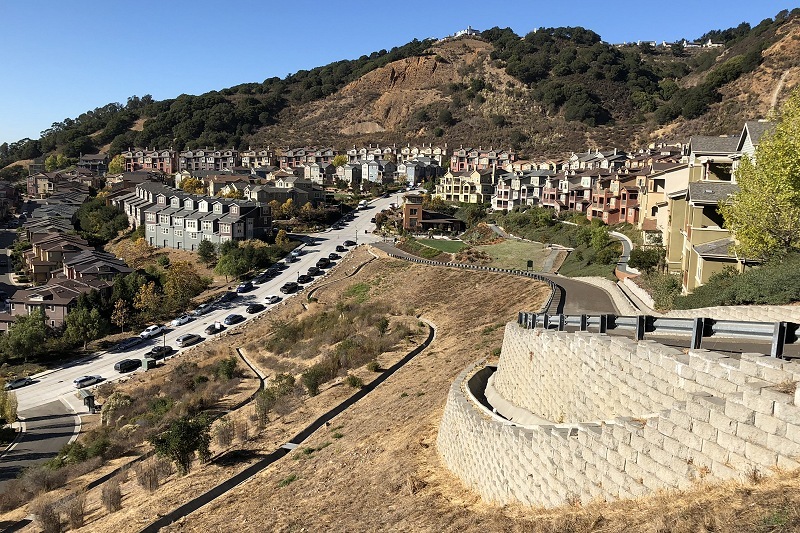 The Leona Quarry GHAD was formed in 2005, and by now it has saved up several million dollars of landowners’ assessments for maintaining the defenses — the retaining walls, drainage facilities, native plants and so on — and for major incidents like slides, wildfires and washouts. In emergencies, the GHAD can act with funding in place, trusted experts (from ENGEO) in charge and minimal red tape. As spelled out in the Engineer’s Report, the concrete drains are cleaned and inspected four times a year, and checked whenever rainfall exceeds an inch in 12 hours. The collection basin is mucked out whenever it fills to a certain level, and the vegetation inside is cut low whenever it grows above 5 feet high. When a wildfire swept over the north end of the upper slope last year, the GHAD sent its plant specialist out afterward to keep the native habitat in good shape, which in turn helps stabilize the slope. 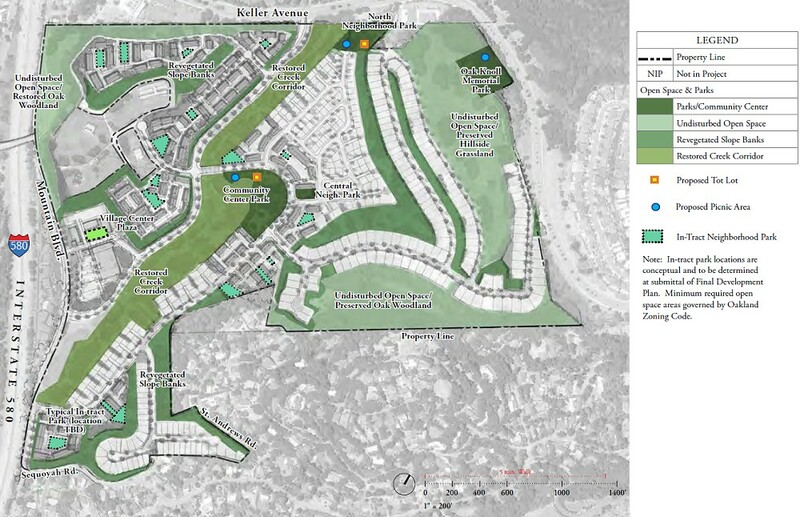 A second GHAD, the Oakland Area GHAD, was established in 2006 for the small Siena Hill development off Keller Avenue. 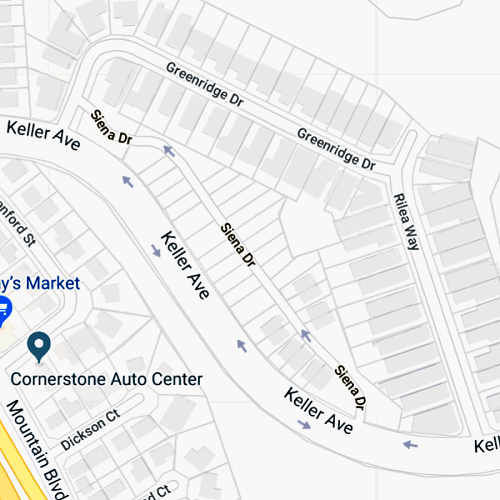 You’ve seen its rugged retaining walls with the fake-stone finish looming as you head east up Keller from Mountain Boulevard toward Sequoyah Community Church. The builders and the city probably wouldn’t have developed this daunting location without a GHAD that enabled the homeowners to cover their own risk. And now the residents pay their annual fee of about $1500 and the City Council, meeting as the GHAD Board of Directors, spends literally three minutes a year passing a budget and keeping its hands clean of liability. Success for the developers is not certain, though, with fewer than half the lots filled after 12 years. However, neither has failure been declared. What’s there so far looks really nice. 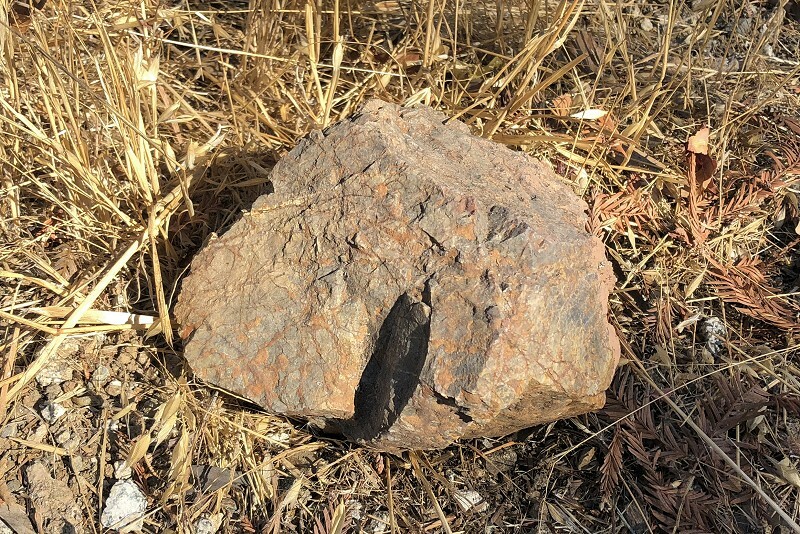 And from my point of view Siena Hill is a success because it exposes the Leona volcanics well, like this pretty boulder at the far end of Siena Drive. 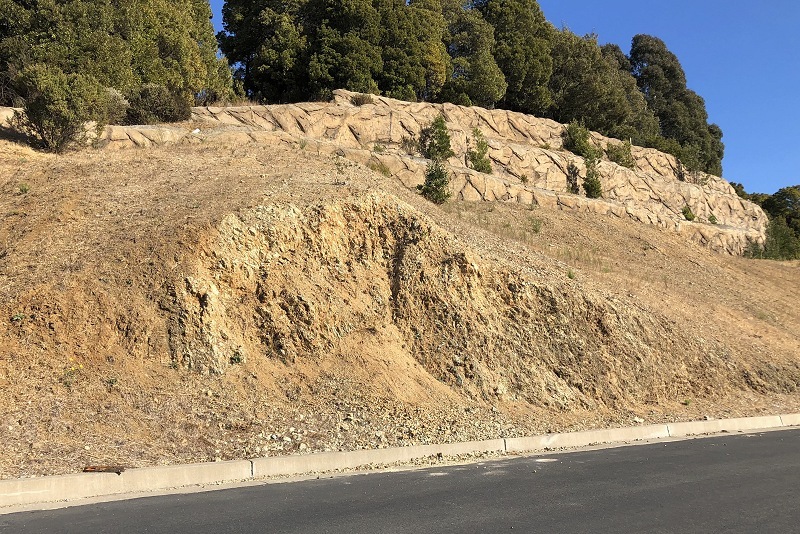 Farther up is a fresh roadcut that displays the chaotic nature of this intriguing geologic unit, which represents a volcanic island arc of Jurassic age. 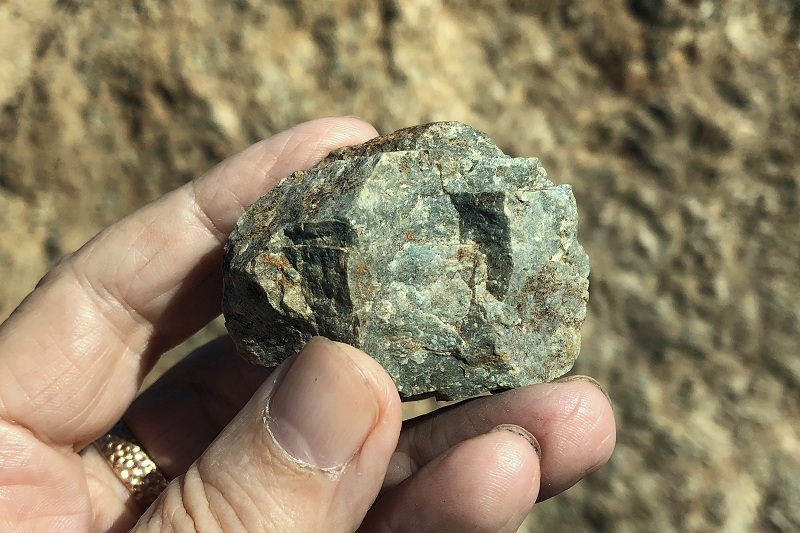 The whole thing consists of the distinctive greenish celadonite-bearing phase that I’ve found scattered all over the East Oakland hills. This is the first proper outcrop of it I’ve seen. Well worth a visit. But enough of this stone cheesecake. 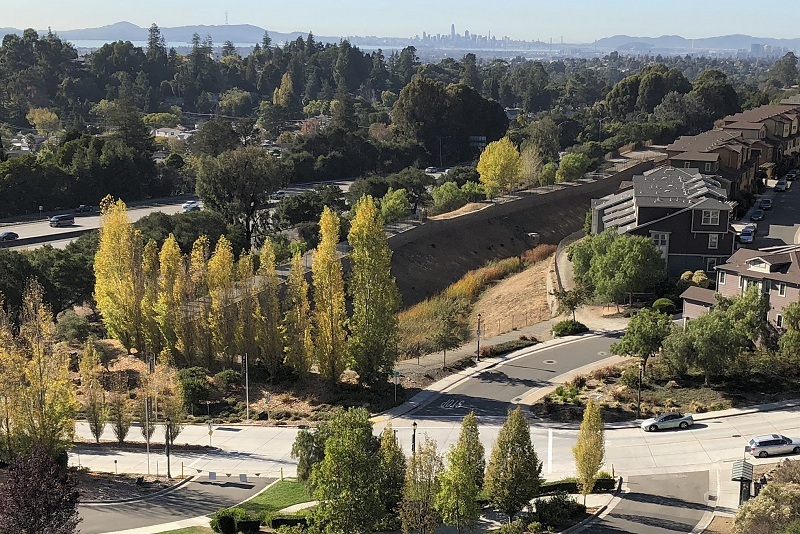 The Oakland Area GHAD is more than just a minor political curiosity; it was established with an eye toward folding in other similar developments as they come up. 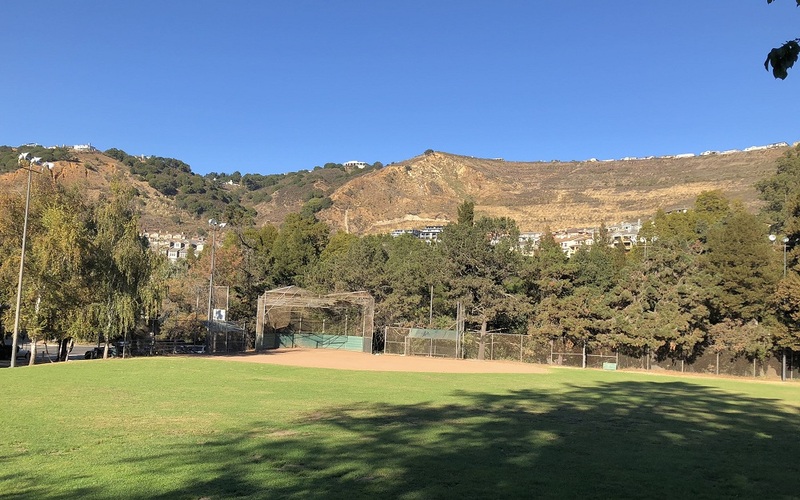 And it will hit the big time as the Oak Knoll development takes place over the next decade, because a whole bunch of land there, including the open space, the oak woodlands and the streambed of Rifle Range Creek, will come under the GHAD’s purview. The City Council may have to take a few more minutes from now on to manage that. Work at Oak Knoll began in September. I am looking forward to the day when that land opens up to visitors. This entry was posted on 12 November 2018 at 8:02 am and is filed under Oakland hazards, Other topics. You can follow any responses to this entry through the RSS 2.0 feed. You can skip to the end and leave a response. Pinging is currently not allowed. Actually quite fascinating stuff. Then there’s the bit of geology. So the Leona volcanics are a totally different ball-of-rock than the Sibley! That whole aspect of the East Bay Hills is new to me. Is it related to the basaltic ridge above San Leandro? What about it’s realtionship to the various exposures of Coast Range Ophiolite? Thanks, Andrew, for enlightening us about this bureaucratic entity and its (probably appropriate) “superpowers”. 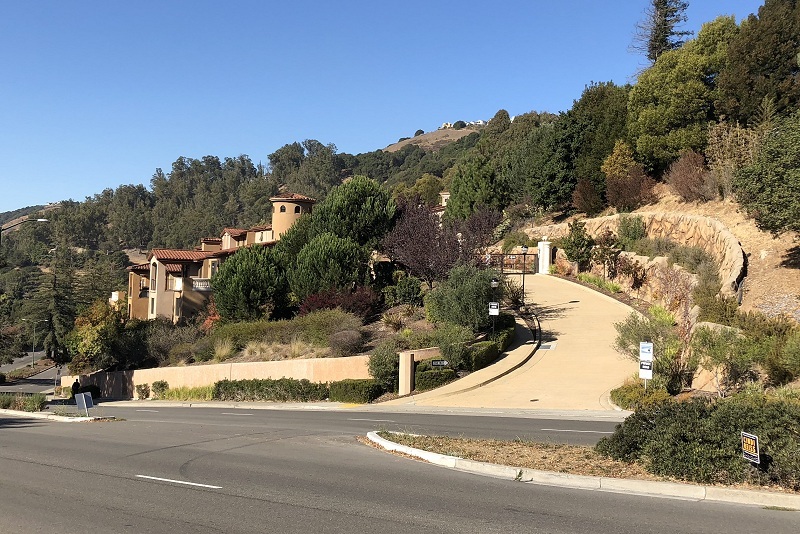 As regards the Sienna Hill / Oak Knoll developments, the area is fascinating because it is close to the site of old Leona Stables – and likely was a killing field used by the vaqueros employed by Antonio Peralta for skinning cattle. 1. What kind of accomodations were there for the 143rd Field Artillery cavalry unit of the CA National guard, before the Oak Knoll Naval Hpspital was build around 1940? 2. Where did the old York Trail terminate? 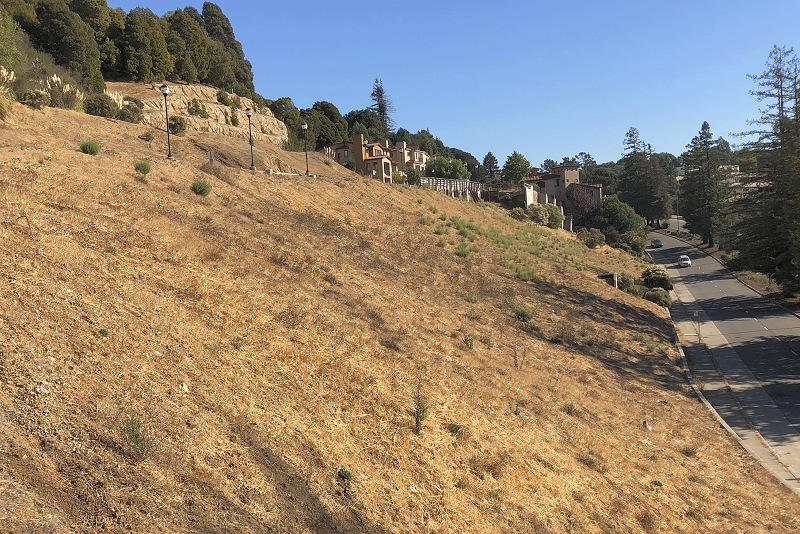 We know that it passed on the east side of the Sugarloaf (between Merritt College and EBRPD Leona Canyon open space) and along the west-facing slope of Leona Canyon. My theory is that it followed Greenridge Street, met Rifle Range Creek, and was obliterated somewhere on the hospital ground. Days of study of old maps may prove illuminating.